5.MD.5 – Relate volume to the operations of multiplication and addition and solve real world and mathematical problems involving volume. 5.MD.5.c – Apply the formulas V = l × w × h and V = b × h for rectangular prisms to find volumes of right rectangular prisms with whole-number edge lengths in the context of solving real world and mathematical problems. Samples: Cubic Cm Rectangular Prism. Matching - three-dimensional objects with their nets. Naming prisms and pyramids. Samples: Naming prisms and pyramids. 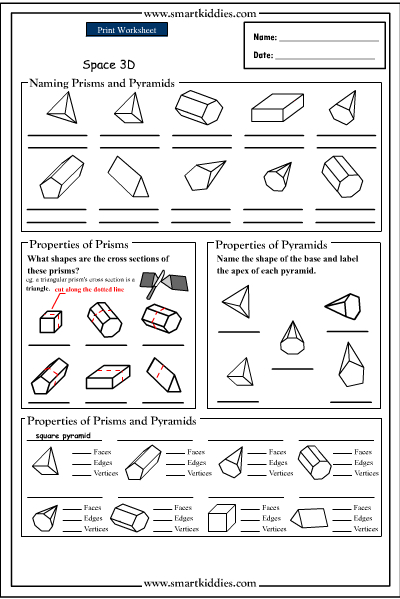 Challenge Puzzle - prisms and pyramids. Prisms and pyramids. Naming prisms and pyramids.